[Uphome Design] -This Uphome wall hanging made of 100% lightweight polyester with printed top and finished edges, features a classic Moon and Mountains theme, which can blend with any existing home decor. Printing on one side will be a valuable addition to your room. 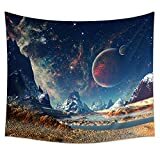 [Multiple Sizes and Match Choice] This Tapestry available for 2 sizes in your room: 51 inches by 60 inches and 60 inches by 80 inches. You also can search SHOWER CURTAIN(ASIN: B075D9X1QW) and BATH RUG in our store to find you prefer one.